WINNIPEG – After a spectacular May when sales went over 1,600 for the second time in WinnipegREALTORS®MLS® sales history, June sales and dollar volume activity settled down in comparison. Even for previous Junes when sales in the past five years have surpassed 1,500 June 2012 fell back under the 1,500 mark. However a new June dollar volume record was still set eking out a slight gain over last June. 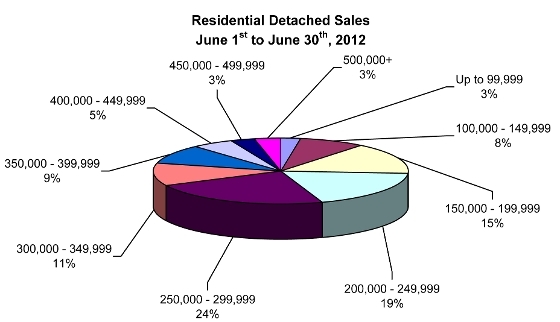 Based on a ten-year running average for June sales, 2012 sales are still very respectable with 3% more sales activity. The best June in 2008 of 1,564 sales is only better than 2012 by less than 5% so there is a lot to be said for consistency in the month of June. New listings coming onto the market in June showed a 4% improvement over last June with close to 2,000 new listings. The overall inventory of 3,357MLS® listings is up by a 1% margin over 2011 for this time of year. JuneMLS® unit sales were down 2% (1,487/1,516) while dollar volume was up less than 1% ($369.4 million/$367.9 million) in comparison to the same month last year. Year-to-dateMLS® unit sales are up 4% (6,921/6,660) while dollar volume has risen 10% ($1.70 billion/$1.55 billion) in comparison to the same period last year. The equivalent of three out of every four listing new to theMLS® market in June sold and that statistic a strong conversion rate. For the first half of 2012,MLS® sales are off less than 1% from the record pace set in 2007 while dollar volume is well ahead of the highest previous total in 2011. For residential-detached sales in June, the most active price range was from $250,000 to $299, 999 with 24% of total sales. The three most active price ranges from $150,000 to $299,999 comprised 58% of total residential-detached sales. The highest sale price in June was $1,050,000. In stark contrast the lowest sale price was $29,000. 44% of all condominium sales in June fell within the $150,000 to $199,999 price range. Both the $100,000 to $149,999 and $200,000 to $249,999 price ranges had 17% each of total condo sales. The average days on market for condominium sales was 27 days, one day faster than last month and five days slower than June 2011. The average days on market for residential-detached sales was 24 days, the same pace as last month and one day off June 2011.